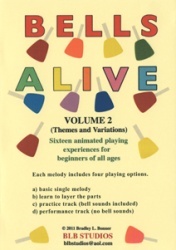 The second installment in the Bells Alive series expands on the 1st volume by introducing the handbell players to themes & variations. Includes 16 playing experiences for players of all ages . By Brad Bonner & BLB Sudios. Playing time 47 min.